We invite you to join us to gather with the Kontomble, Amazonian plant medicine Ayahuasca and the great teacher of all trees, Noya Rao, for a profound portal of healing, transformation, and connection to the ancient ways and wise, ancient beings. 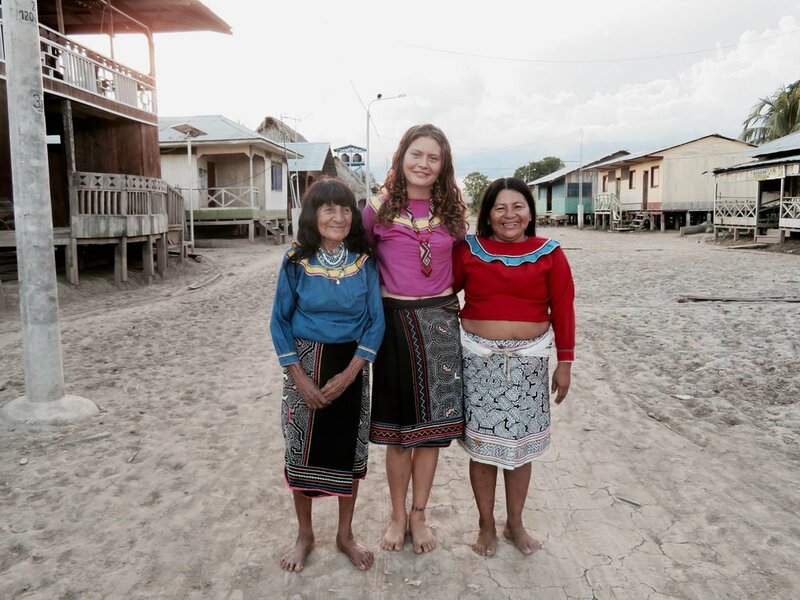 In this journey we will be safely learning and healing directly from the Shipibo tribe. We are receiving the medicine how it has been practiced in ceremonial use for thousands of years, through the Mahua Shipibo family linage. This is one of the oldest strongest living shamanism linages in the Amazon. We will also be learning and healing with the Kontomble, a nation of ‘Little People’ from Burkina Faso West Africa, the spirit-being of Ayahausca, and the Tree of Life, Noya Rao. Liv recently decided to share a little more deeply about the journey, via audio recording, now that she can sense more deeply into the energies of the gathering. The Shipibo, are a native tribe to the Amazon of Peru. They’re one of the largest tribes with a population of around 45,000 people, mostly living in small communities along the Ucayali River. They are a shamanic-ally based people, deeply influenced by the power of the plants, animals and natural elements. A unique aspect of the Shipibo culture is their woven song tradition. Teacher plants are master plants that teach us, about ourselves, the world and the spirit world. The concept of plants as ‘teachers’, ‘spirits’ and ‘doctors’ is of paramount importance in Shipibo Shamanism. Each plant contains a powerful spirit that through the diet process you will be in total receptivity of: learning, working and receiving ancient and other worldly knowledge from. Ayahuasca is the web which holds all the knowledge of the plants together. The Ayahuasca ceremonies are a vital aspect of the studies and journey into Shipibo shamanism and our gathering together. Issues that have tormented the soul, body and mind can be dissolved in a single song and what remains is visions of yourself in your highest health, potential and happiness. The tree we will be studying alongside Ayahuasca is called Noya Rao. In the Shipibo language Noya translates to flying, and Rao is remedy, which means flying remedy. The Noya Rao is the Shipibo totem tree, the tree of light and life. It is a symbol deeply woven into the cosmology of the Shipibo people. They call it ‘camino de la verded’ (way of truth) and ‘camino de la luz’ (way of light). Studying this tree is the royal road to becoming a healer. Also to heal medical, spiritual, emotional, mental and physical conditions. We will also sit in ceremony with the Kontomble. The many nations of the ‘little people’ around the world hear our prayers and lovingly tend our soul’s paths and the health of the earth. These spirit-beings have unfailingly carried tradition, art, music, medicine, memory, and hope across the ages as our relatives, teachers, and allies. We will hear from these wise starry beings as they transmit their medicine, wisdom, and messages through from the interdimensional realms. Throughout the gathering we are opened to the spirit world, the veils between realities can be lifted. We will attune to the subtle energies of other worlds and learn and heal with their profound and wise beings. The Sui Sui Center, your home for the duration of our journey, is located deep within the Shipibo homeland of the Peruvian Amazon. Sui Sui is fueled completely by solar power and is situated on fifty acres of thriving Amazonian forest land. Within Sui Sui’s labyrinth like gardens you will find an astonishing selection of various medicinal plants including the mother Ayahuasca and native Amazonian plant life. While at Sui Sui you will sleep in a jungle bungalow (or Tambo). Each Tambo is protected from mosquitos by a special screen surrounding the doors and windows and has double bed. This is a profound initiation entering into a whole different world and way of life. The conditions are basic, traditional and real; this is not a fancy retreat style setting but it is a retreat from the outside world and external influences. Here we will enter into a journey together, it is also a deep individual experience and communion with ourselves, with the Shipibo cosmology, teacher plant spirits, and the Kontomble. For more information and photos of this beautiful location and the accommodations you can visit: http://www.ayahealingretreats.com/ayahuasca-retreat-center/. As there is only space for 12 people in this gathering and it will entail ingesting medicines, each participant will need to apply for a space. After an application is received and approved, the nonrefundable deposit will be required to reserve your space. You would then receive a registration form, liability and medical waivers, a healing agreement, and more information on how to prepare for our time together. To receive an application, please email Sylvie at ancestorbridgeteam@gmail.com. To reserve your space, a nonrefundable deposit of 500 USD will be required. The remaining payment will be due before the gathering takes place. Monthly payment plans are available. Please reach out to ancestorbridgeteam@gmail.com to set up a monthly payment plan. More information on Noya Rao, Ayahuasca, Kontomble, the plant dieta, the Shipibo people, or the gathering itself please feel free to reach out to ancestorbridgeteam@gmail.com.